It is May 1st and the start of my annual Birthday Month of Giveaways! Today I'm happy to say Karen Klepsteen is the winner of The Aetherlight: Chronicles of the Resistance! (Thank you Karen for reading grandma's cookie jar - please email me at lyndagcj@gmail.com by May 8, 2016 and I'll email you a special code so you will be able to receive this game!) and thank you Scarlet City Studios for making this game available for me (and my grandson) to review and an additional code for me to give away! 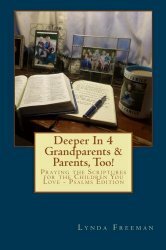 I'm very happy to say tomorrow - May 2, 2016 I am giving away one copy of Deeper In 4 Grandparents & Parents, Too! Praying the Scriptures for the Children You Love - Psalms Edition. You'll find the review and specifics for entering at this link - but you still have time to enter! Who knows??? Maybe you will win!! !